If you do not agree to this can you please leave this site. The majority of gun safes and gun cabinets are made from folded steel with no additional barrier material or hard plates added. Although this means they are very cheap to produce, gun safes or gun Cabinets do need to comply to BS7558. The locks fitted to gun cabinets are generally of a standard that you will find on a domestic safe. Please note that it is a requirement when picking open gun cabinets that if their are guns in them, then the certificate holder must be present when the gun safe is opened and also to receive the new keys. When the owner lost his keys to this Brattonsound double locked gun cabinet he called numerous locksmiths who all told him that the cabinet had to be drilled open. He was so convinced by them that when he read the Safecracker site, he didn't believe that the locks could be picked. Safecracker attended and after a few minutes of picking, the first lock opened. A quick cup of coffee and a leg stretch later, safecracker started on the second lock. After a few more minutes the second lock also opened. 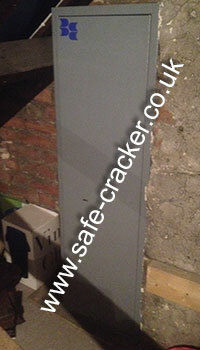 Safecracker then rekey the cabinet putting it back in to full service, with no damage what so ever. If you need a brattonsound or any other gun cabinet opening, call safecracker. When the owner lost the keys to this Brattonsound ammo cabinet he called safe cracker. We attended and picked open the two fitted 7 lever locks, opening the cabinet with no damage what so ever. We then returned this Brattonsound ammo cabinet back to full use. Keeping the cabinets BS rating in tact. If you have lost the keys to your Brattonsound ammo cabinet, call safecracker. When the owner lost the keys to both his Brattonsound gun cabinet and his Brattonsound ammo cabinet he telephoned a number of locksmiths who all told him that they would need to be drilled open. 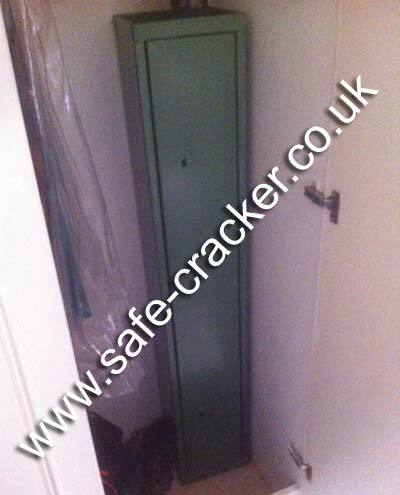 He then called safecracker, not only did safecracker confirm that he could pick open both cabinets, he gaurenteed it! 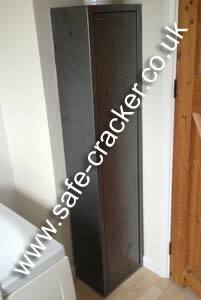 Safecracker then attended and true to his word picked both cabinets open with no damage what so ever. Both cabinets were then put back in to service with new locks and keys. If you have a Brattonsound cabinet, do not let a locksmith drill it. Call safecracker I will attend and pick them open. When the owner lost the keys to this Brattonsound gun cabinet he called safe cracker. 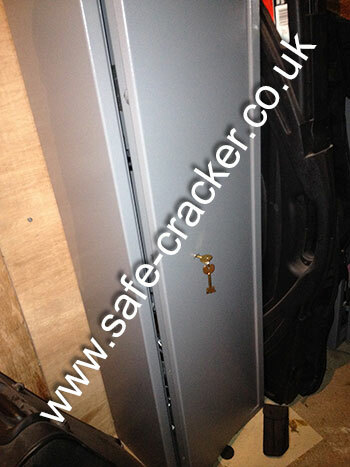 We attended and picked open the fitted 7 lever double throw lock, opening the cabinet with no damage what so ever. We then returned this Brattonsound gun cabinet back to full use. Keeping the cabinets BS rating in tact. If you have lost the keys to your Brattonsound gun cabinet, call safecracker. When the owner of this Boxx gun safe lost all the keys to it, he called safecracker. We attended and picked open both of the fitted 7 lever locks and opened this Boxx Gun Cabinet for him. We then swapped the locks and provided new keys. If you have a Boxx Gun Cabinet that you need opening call safecracker. When the owner of this Boxx gun safe lost both sets of keys to it, he called safecracker. We attended the next day and opened this Boxx Gun Cabinet for him. We then swapped the locks and provided new keys. 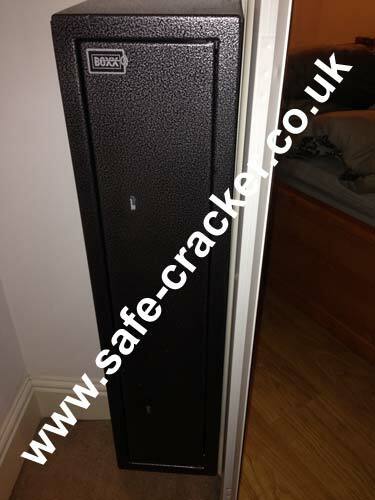 If you have a Boxx Gun Cabinet that you need opening call safecracker. When the owner of this gun cabinet returned home he found it had been burgled and that the keys to his gun cabinet had been stolen. As the keys had been stolen he was now unable to open the cabinet and confirm to the police if the guns were now in the criminals hand. He called safecracker, we attended that night and opened the cabinet for him. We are pleased to say that all the guns were still present. If you need a gun cabinet opening call safecracker. On jobs like this we do not charge extra for working out of hours. When the owner of this double locked gun cabinet could not find the keys he called safecracker. From the photographs he sent, we were able to identify the fitted locks as Chubb 3G114's. When fitted to gun safes the 3G114 lever pattern does not need to follow the standard ABA pattern as they do when fitted to domestic doors. After opening the gun cabinet we were shown some truly amazing antique firearms, including one double barrelled weapon that could be fired with either a black powder charge or a percussion cap. If you need a gun cabinet or gun safe opening call safecracker. When the owner of this Boxx gun safe lost the keys, we attended and picked open the locks leaving no damage to their Boxx gun safe. 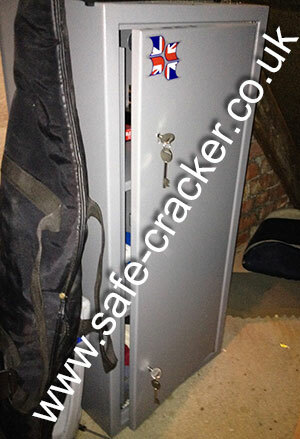 We then re-levered the locks and provided new keys, leaving this Boxx gun safe back in full working order. If you have a Boxx gun safe that you need opening call safecracker. When the shot gun certificate holder sadly passed away, quite correctly nobody knew the combination to either of these electronically locked gun safes or where the keys were to any of the other 5 gun safes, the home safe or for the new red Ferrari that was parked in front of them. 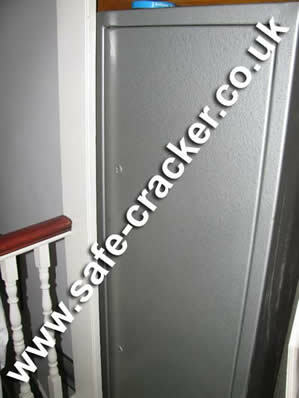 Safecracker attended and using safecracker logic, cracked this Sentry safe first. Bingo, all the keys to all the other safes and the Ferrari were in this first safe. Unfortunately the combination to the second safe was not, so we cracked that one too. 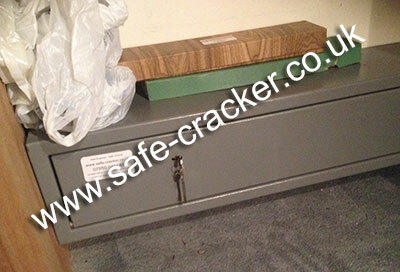 On this job safecracker logic saved the estate the cost of having to crack all of the additional safes. 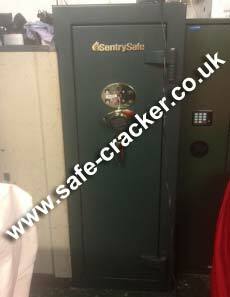 If you need a Sentry Gun Safe or any make of gun safe opened, call Safecracker.